Government of Tamil Nadu, with the objective of providing protected water supply as well as Under Ground Sewerage Schemes to the local bodies in Tamil Nadu excluding Chennai Corporation constituted Tamil Nadu Water Supply and Drainage Board as a statutory body on 14.04.1971. The Board office at Chennai is headed by the Principal Secretary to Government, MAWS Department as Chairman and Managing Director is the Chief Executive supported by Technical, Financial and Administrative Wings. 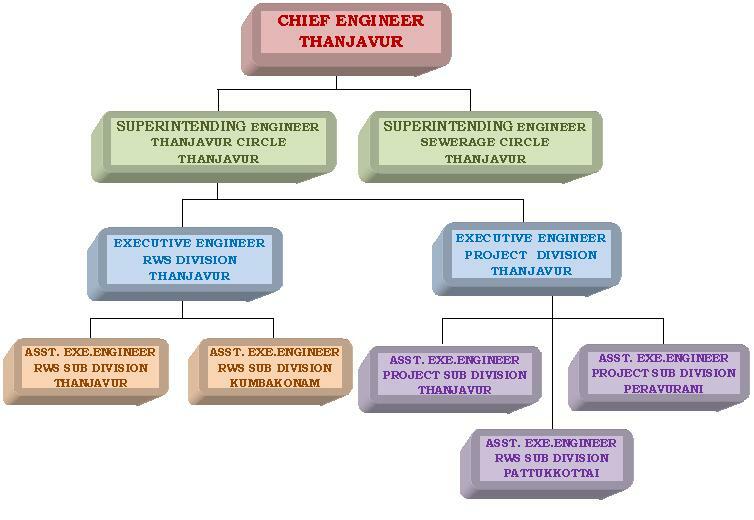 There are four Chief Engineers at Regional level with Headquarters at Vellore, Thanjavur, Coimbatore and Madurai. There is one Project Chief Engineer at Dharmapuri. As per G.O. (Ms) No.84, Municipal Administration and Water Supply Department, dated 10.03.1994, the CWSS covering more than one local body are being maintained by TWAD Board. As on date, 553 Combined Water Supply Schemes covering 8 Corporations, 66 Municipalities, 324 Town Panchayats, 47,136 Rural Habitations and 532 Industries / Institutions, benefiting a population of 4.21 Crore are being maintained by TWAD Board. Inspite of the prevailing drought conditions, an average of 1,440 MLD of water was supplied during June 2017 through these 553 Combined Water Supply Schemes to local bodies and Industries/Organisations as detailed below.